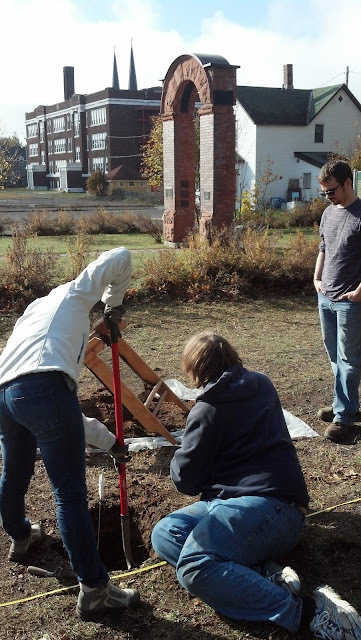 This Saturday and Sunday students from Michigan Tech's Industrial Archaeology program began doing physical archaeology at the Italian Hall Memorial site. The purpose of the archaeological work was to do sampling, in the form of shovel test pits, of what is under the site of the Italian Hall. With this information, the National Park Service's Keweenaw National Historical Park will create a landscape design for future interpretation and education efforts at the site. Dr. Tim Scarlett, who was leading the dig, was surprised and confident that the archaeological work at the site yielded enough information to give Keweenaw National Historical Park some solid information on which to plan for the landscaping work at the site. 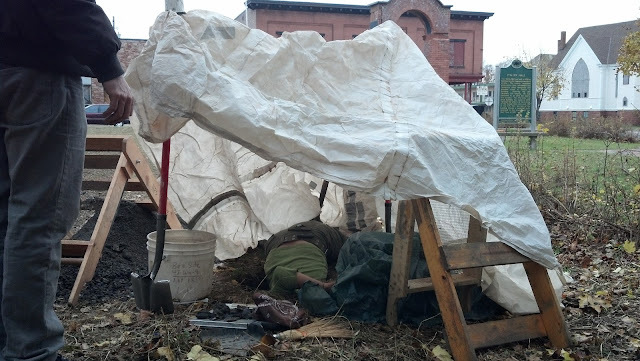 I (Gary) was able to participate in the dig on both Saturday and Sunday. Saturday was a beautiful fall day in the Keweenaw and the group that I was working in found what is likely the foundation of the Italian Hall. I'll post photographs of this foundation, which we found at about 40 cm underground, and other interesting finds from this weekend. I have to write that excavating and finding what is likely a part of the Italian Hall's 1908 building foundation was a unique and moving experience. What we uncovered was buried for over 100 years and the simple smooth faced stones buried in the ground are physical connections to the tragic building that reminded us all of the significance of the work we were doing. I got chills when I first saw the rough face of the stone foundation as I saw it emerging from the dirt and rubble that had buried it for over 100 years. It was truly a great experience and I feel honored to have been a part of the students, volunteers, and project staff who were working at the site. 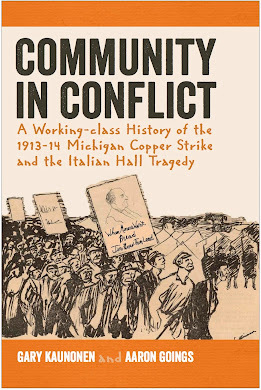 My thanks to Dr. Tim Scarlett and Keweenaw National Historical Park for including me in this work. Saturday's digging was under warm, sunny skies. This group of Tech Industrial Archaeology Program students digs into the lot adjacent to Italian Hall as the Memorial Arch watches over the work. In the upper right hand corner of this test pit is what is believed to be a small section of stone foundation from the Italian Hall. 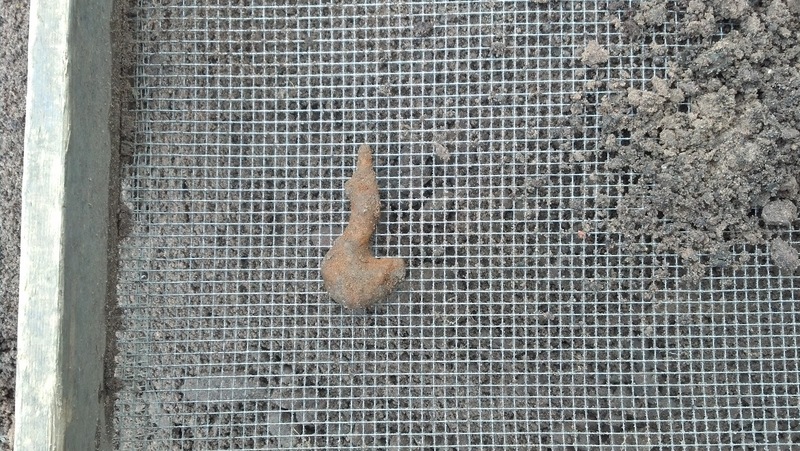 Our team of workers unearthed this through rubble seen sticking out into the shovel test pit. It was amazing to be able to dig this up; it was an experience I will always remember. Michigan Tech Industrial Archaeology program student Roger Gerke beginning a shovel test pit in the rear quarter of the Italian Hall Memorial site. There were three shovel test pits dug in the Italian Hall Memorial site, of these only two were inside the historical building. The shovel test pits, once bottomed out, are then filled in and sod is replaced to leave as little impact at the site as possible. Difficult to believe, but there is a person under this makeshift tent and down about 80 cms below the ground. This shovel test pit, located in a lot adjacent to the Italian Hall Memorial site yielded very interesting finds and bottomed out at about 100 centimeters. 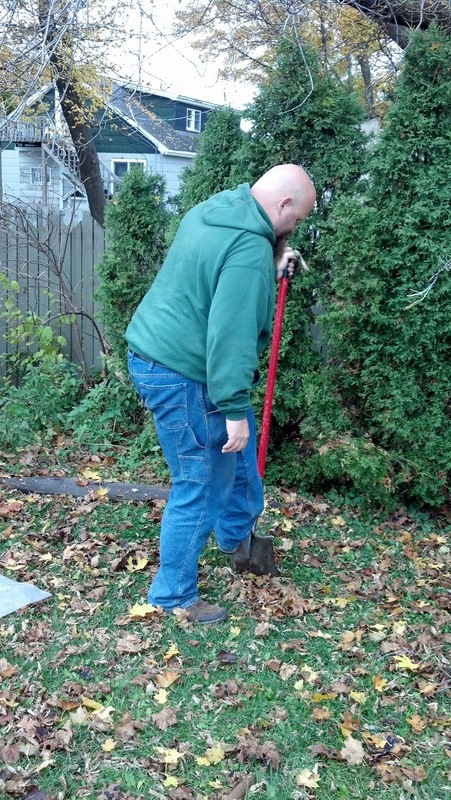 The person excavating the shovel test pit only stopped because a wooden floor was hit at 100 centimeters. As dirt is screened from digging in the shovel test pits, small pieces of physical history emerge. 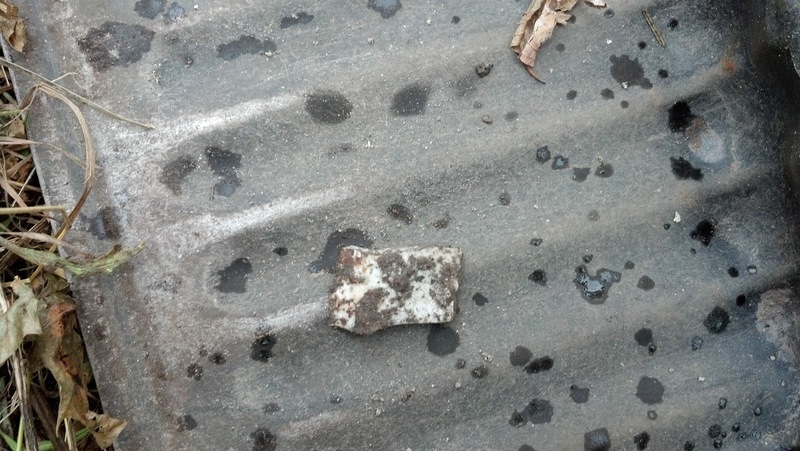 This tiny artifact is a piece of porcelain from the lot adjacent to the Italian Hall Memorial site. Through historic photographs and maps, it was determined that this lot housed a saloon and residences and this piece of porcelain probably came from one of those historic residences. Iron artifact from a shovel test pit inside the Italian Hall--or rather from inside where the Italian Hall once stood. 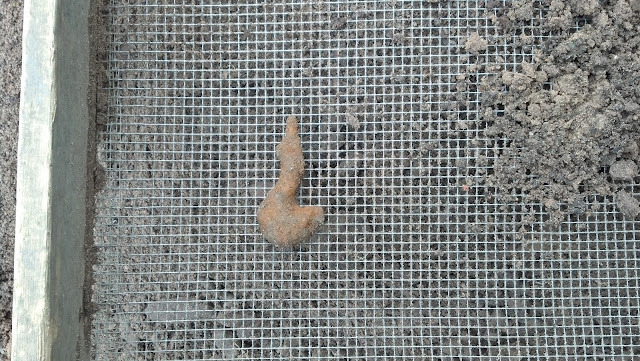 It is thought that this artifact is perhaps a piece of hardware, perhaps a coat hook. The Italian Hall's interior had many coat hooks and the depth of this coat hook in the ground, indicated that it was a historic artifact, likely from Italian Hall. The next step for this artifact is a good cleaning in the Tech's Industrial Archaeology lab to remove the rust and dirt from around the artifact. Difficult to tell from this image, but this shovel test pit goes down about 100 centimeters. 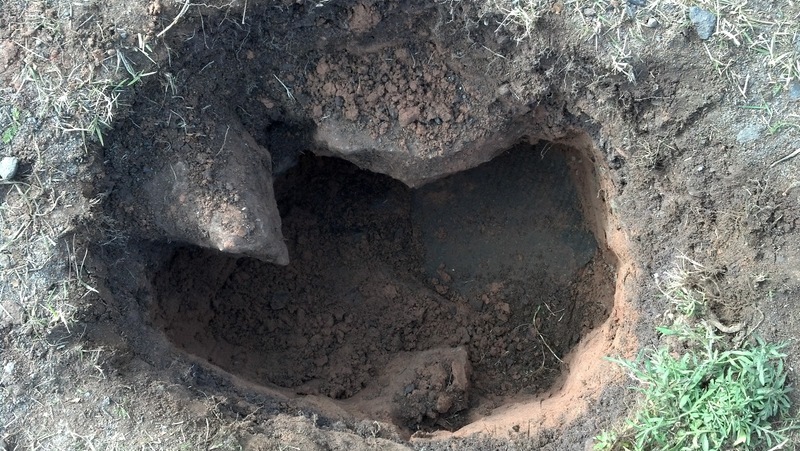 The various layers or levels of soil can be seen in the walls of the shovel test pit. 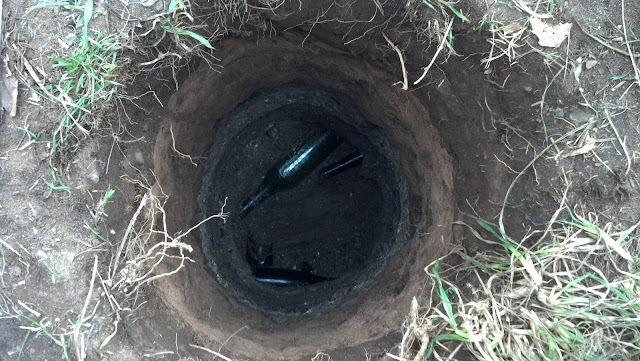 The bottom of this shovel test pit proved very interesting as a number of glass bottles and glass bottle fragments sat on top of a wood floor.